As with Business Cards clients want their Letterheads to be professionally designed and printed. It could be their client’s first point of contact with their company and so constructs in their minds an image of what the business is all about. 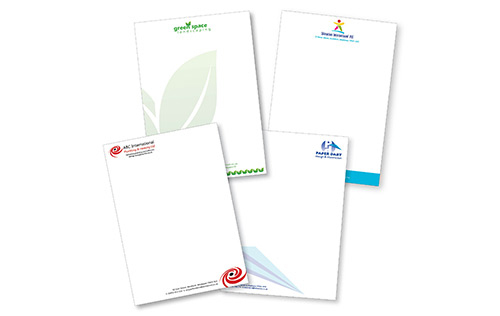 Letterheads are normally A4 (297 x 210 mm) and printed on a quality paper like Conqueror 100gsm or 100gsm bond. We print in black, specific corporate colours or full colour. Often Compliment Slips and Business Cards are designed at the same time so they are consistent and reinforce the image that clients are wanting to project. FAST – We print drawings and plans and deliver them to you in a few hours. LOCAL – Free local delivery is part of our service. Please note we do not offer a walk in service in Slough – in an emergency you can have plans printed while you wait in our centre in Clarence Street, Staines - or you can collect from our centre in Clarence Street. We have a car park for customers’ use behind the centre.